Home › Sociology › gender & feminism › Thirteenth Down Under Feminists Carnival is Up! Thirteenth Down Under Feminists Carnival is Up! 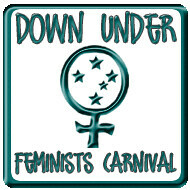 The Lucky Thirteenth Edition of the Down Under Feminists Carnival is up at Demelza’s place, SAHM Feminist. Many thanks to Demelza who has somehow done this while moving house! The fourteenth edition of the carnival, for June posts, is planned for the first week of July, 2009. It will be hosted by anjum rahman at Kiwi Stargazer. Submissions to kiwistars at gmail dot com for those who can’t access blogcarnival. After that, we’re gathering at Hexy’s place, but after that? September, November, and future slots are open. Who’d like to volunteer for a future carnival?